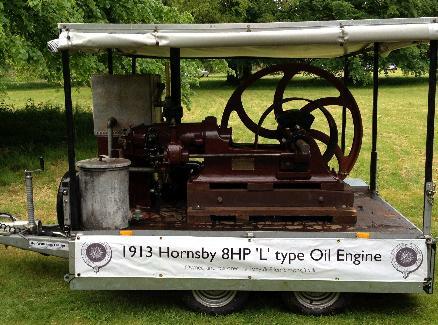 1913 Hornsby *HP 'L' Tpe Oil Engine. It was supplied new to the Hornsby Agents, Ralph Yates and Son, in North Yorkshire on 24th November 1913. I am not aware of any other history other than I bought it in 2009 from Ryedale Folk Museum where it had been laying outside for a number of years. It was nearly complete, the major part missing is the fuel/injector pump. I have managed to get the pump casting and that has been machined but I still have to make a mounting for it. I stripped the engine completely and repaired a few components and manufactured others on the way. Click on the image on the left to see how the restoration progresses.